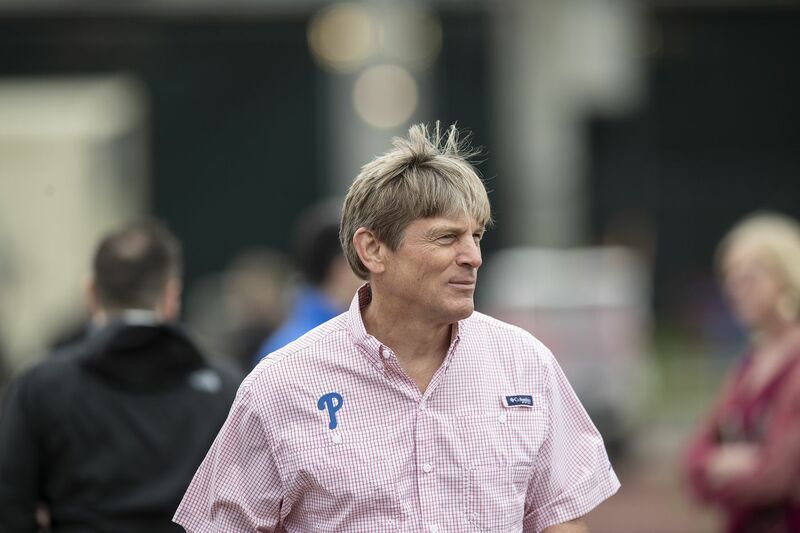 Philadelphia Phillies owner, John Middleton looks on during the first day of spring training at Spectrum Field in Clearwater, Fla. Wednesday, Feb. 13, 2019, in Clearwater, Fla.
None of that is hyperbole. Harper is that good. He is a game-changer, and anybody who tries to argue is somebody who lacks a clear understanding of fundamental components of the game. The first of those components is the ability to not make an out, and, with a career on-base percentage of .388, Harper has done that better than all but five players since entering the National League in 2012 (minimum 1,000 plate appearances). The second fundamental component is the ability to hit for extra bases. In his seven seasons in the majors, Harper’s .512 slugging percentage ranks 19th. Same goes for his 184 home runs. The third fundamental component is defense, and, here, admittedly, the metrics haven’t been as kind. But Harper will be far from the worst defensive corner outfielder the Phillies have started over the years. This is about ceiling, about the upper boundary of the range of possible outcomes. Harper’s might be higher than that of any current player not named Mike Trout. In fact, we’ve already glimpsed it -- back in 2015, when Harper won the National League MVP award. He finished that season with a .460 on-base percentage, a number that had been equaled only 34 times in the integration era. Likewise, his .649 slugging percentage was higher than that of any player since Albert Pujols in 2009 and was equaled only 46 times since integration. The real story, though, is that Harper was just 22 years old that year. When he takes the field at Citizens Bank Park on Opening Day, he will be just 34 days older than Ryan Howard was at the start of his first full big-league season. Granted, Howard’s is a scary name to invoke in a discussion about the wisdom of a long-term contract. None of what you are reading is meant to imply that the Phillies aren’t adding a significant amount of risk to their books. If Harper’s skills follow the same trajectory as Howard’s, the second half of his deal will inflict some serious pain. But, this is also as manageable and calculated a risk as a team can possibly take on a contract of this length. For luxury-tax purposes, it will count as a $25.4-million charge in each of the 13 seasons of the deal. That means, in any given season, it will have less of an impact on the team’s ability to spend than the extension that Nolan Arenado just signed with the Rockies ($32.5 million), or the mega deal that Manny Machado just signed with the Padres ($30 million). Among current deals, it ranks just 12th in terms of average annual value. Even with Harper’s salary, the Phillies should enter next offseason with their entire current lineup, their top three starters, and their top two relievers at a combined total of less than $150 million, leaving upward of $50 million to fill out the rest of the roster before running up against the luxury tax. In other words, this does not kill the Mike Trout dream. Maybe it even enhances it. The most surprising aspect of the deal isn’t the length or the dollar total, but the lack of any opt-outs, an increasingly common insistence on the part of agents looking to maximize their clients’ career earnings by giving them an opportunity to cut a deal short and renegotiate more guaranteed money as a free agent. In signing this deal, Harper committed to being in Philadelphia for the rest of his career. If he plays out the duration here, he will have been here longer than Chase Utley, and Larry Bowa, and Richie Ashburn, and Ryan Howard, and Pat Burrell, and Cole Hamels, and so on. That’s a staggering thought. The Phillies did not just buy a player. They bought a brand new era. And when you look at it that way, they paid a manageable price.